These travel wardrobe ideas are for the times when you are planning a trip and you have read about the destination. 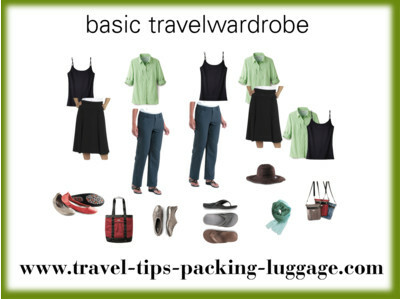 You know what would be suitable for your travel wardrobe but still need a little help with the details. Whether you are starting from scratch or are only adding or updating, we can help. We are going to be putting together mix and match for different locations and various situations. Maybe you want to know what to wear to the Moulin Rouge in Paris or the ballet in Saint Petersburg Russia for example or a beach resort. You would still start with the basics, but you may need a few more things depending on your destination, your planned activities and the climate. This should help you with your own wardrobe plans. I find that a good way for me to do this is to share my boards at shoplook. As the questions come in we will add boards. Do you have any great travel wardrobe ideas? Share it! Please read the submission guidelines to make sure your post will be accepted. You will see here below that with just four clothing pieces you could have at least twelve outfits. The pants turn into capris the shirt has a roll-up sleeve and could be worn open like a light jacket. Add different shoes some jewelry with the camisole and the black skirt and it dresses it up, add the scarf as a shawl, or a belt. You get the idea. Purchase the shirt in your favorite colour or a neutral. Get extra tops cami's or tanks in various colours and you further the look. Change up the bag and the shoes-dressy for dinner or walking and touring. This would be good for a week or even longer if you launder. Where it all over the world with a few minor changes. Remember it is best to travel with core nuetrals and the latest color with t's, shrugs, assesories etc. It's nice to have a Pack-able tote. You can use it as a light day bag or for those extra souvenirs on your way home. It comes in handy as it can be used many ways. We get questions about what to wear all the time so I started this page... join in the conversation ask your questions and offer your help and experience. Everyone is welcome.